The Robert Mondavi winery was established in 1966 and has grown to be a producer of some of the most distinctive wines on the market today. It was the very first large winery to open in Napa Valley after Prohibition ended, and it has become a historical landmark over the past four decades. In addition to producing a great variety of wines, the winery is also dedicated to preserving and carefully harvesting the vineyards that religiously produce for this winery every year. Robert Mondavi is dedicated to responsible farming and preserving nature as much as possible throughout the wine making process. One of the greatest and most innovative aspects of the Robert Mondavi winery is its commitment to preserving the environment. The winery has a dedication to natural farming, which not only helps to protect nature, but also helps to protect people from harmful chemicals. The winery uses the most advanced forms of technology available to monitor its vineyards. In fact, the winery has enlisted the help of NASA to obtain aerial images of its winery and vineyards from space in order to evaluate the well-being of the land being used to produce the grapes. The Robert Mondavi winery is unique in that it is dedicated to promoting arts and culture as perfect compliments to a glass of distinctive wine. With this philosophy in mind, the winery is the host of many cultural events throughout the year. Some of the events the winery sponsors include art shows, music festivals, and concerts. Instead of sitting back and creating wine the same way year after year, the winery has a loyalty to continuous research and development of the industry. In fact, due to acquired knowledge of the best practices in planting grape vines, Robert Mondavi endured the extremely intense job of replanting all of its vineyards in Napa Valley to consist of the most efficient types of grape plants. Not only has this increased the efficiency of the production of wine, it has also proven to be a benefit to the environment. 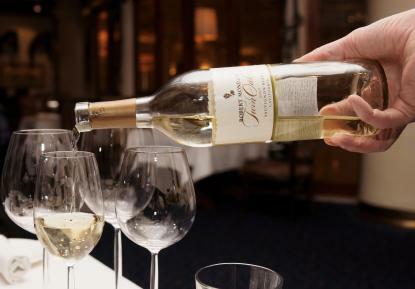 As a proponent of the environment, the Robert Mondavi winery has been able to strictly reduce its use of chemicals to enhance the growth of grapes on its vineyards. The winery has also been able to determine the most efficient ways to water its plants, with conservation being a top priority. The winery produces a wide selection of both red and white wine varietals under different brands, as indicated by the labels. All can be purchased directly through the Robert Mondavi winery's website, or at select wine shops and retailers. The varieties in the Napa Valley Wines collection are fruity in nature and are recommended as a compliment to any sort of cuisine. It includes Fume Blanc, Chardonnay, Pinot Noir, Merlot, and Cabernet Sauvignon wine varieties. The Robert Mondavi District Wines come from the Oakville district, which produce a more robust wine. The District Wine Cabernet Sauvignon is rich in tannins that begin smooth and end in bold flavors. The winery's Reserve Wines are made from grapes chosen from specific vineyards. These wines are some of the most coveted in the world, and are known for their complex flavors. The hand chosen varieties include Cabernet Sauvignon, Pinot Noir, Chardonnay, and Fume Blanc. Spotlight Wines are particular blocks of wines that are within area of a vineyard producing especially good grapes. The winemaker harvests and separates the grapes to create unique wines, and may change when new blocks are identified or rotated. Examples include the To Kalon, a rare 100% Cabernet Sauvignon carefully chosen from To Kalon Vineyard's oldest grape planting. Opus One is a wine calaboration between American wine maker Robert Mondavi and French wine maker Baron Philippe de Rothschild, and the wines produces are touted as being "French in style but Californian in execution." The following five varietals are used but the percentages may from change year to year: Cabernet Sauvignon, Cabernet Franc, Merlot, Malbec and Petit Verdot. The Robert Mondavi winery is open almost every day of the year, and welcomes guests to enjoy and learn more about its history, its wine, its dedication to the environment, and its goals for the future. There are several types of tours available, and many include an oral educational background of the winery, a tour of the vineyards, a visit through the wine cellars, and wine tastings. More information on Robert Mondavi winery tours is available on the Mondavi web site.